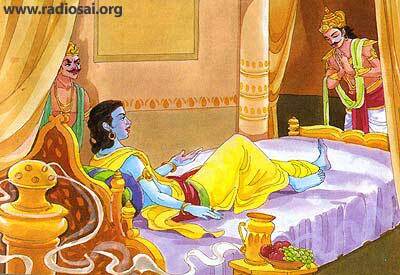 When Sri Krishna was having his siesta, both Duryodhana and Arjuna came to his place. Duryodhana came a few minutes earlier and, as he was full of pride, he stood beside Sri Krishna’s head. Arjuna, as he was full of humility and modesty, stood beside Sri Krishna’s feet. Duryodhana said, “I have also come here to take help from you, and I have come before him so you have to fulfil my desire first.” So Sri Krishna said, “It is true that you came before Arjuna, but I saw him first, and he will I be given the first chance. Besides, he is younger than you. So he will have the first choice. Arjuna said to Krishna with great joy. Duryodhana thought: What a stupid fellow Arjuna is. He wants Krishna alone. Duryodhana felt, what could Krishna do alone and unarmed? The best thing for him was to have Krishna’s army. But Arjuna, being an illumined person, said to himself, “What shall I do with his army? The best thing is to have the Lord with me. The Lord will be able to protect me and the Lord will bring me the victory.” Arjuna wanted Sri Krishna and Duryodhana wanted the entire army of Sri Krishna. Now the promise was that Sri Krishna would never, never fight. Unfortunately, he had to break his promise; he could not keep it. Twice he ran out of the chariot. To kill whom? Bhishma. On the third and the ninth day Sri Krishna found that Arjuna was not fighting properly against his grandsire. Arjuna found it extremely difficult to use weapons against his grandsire. But, both times, Arjuna followed Sri Krishna and said “No, you have to keep your promise. I won’t let you fight, I shall fight. I won’t allow you to eat your words. You come, you sit in the chariot and drive me on. I shall fight. Here we learn that the Guru, the Master, can at any moment break his own promise in order to help, to save, in order to win a victory for the disciple. Sri Krishna was the Omniscient, Omnipotent, Omnipresent, and also the Just. But when the question concerns a most intimate disciple, the Guru goes against the ordinary light of morality. This was Sri Krishna’s heart for Arjuna. Victory Is There, Where Dharma Is! instructive stories they hear so that everyone can be benefited by hearing about Krishna and his dear devotees. The photos/painting & pictures posted on this page are for informational, inspirational and viewing purposes and they are the property of the copyright holder. No copyright violation was intended. This page does not generate any income from them. Majority of what we are posting here are images being shared publicly on Facebook. If we posted something here that you think you have a copyright on and do not wish to share it to the public or want your credits added, please email us (bhagavatam.katha@gmail.com). "Artwork [or photos, or text] courtesy of The Bhaktivedanta Book Trust International, Inc. www.krishna.com. Used with permission."